Pension Metuje is the imposing steep-roofed building that gazes over Teplice nad Metuji from the hillside above town, and is fairly typical of those big collective resorts built for the workers in the communist era. If you’re staying up near the park entrance the best way to walk here is along the blue marked trail that leaves the road and crosses the train tracks from in between pensions Tara and Skaly. According to one local, it has the best kitchen in town. There’s a terrace at the rear but there’s likely to be no service out there, so you’ll need to order your drinks and food at the bar and carry it out yourself. The dining room, like the pension itself, is BIG. There are tables set for up to ten diners and a total capacity of well over a hundred. The gentle burble of conversation in the dining room was quite pleasant until it was ruined by noise from the blasting television. While it will probably never win any awards for fine cuisine, the food at the Metuje seems to be the solid, filling and well-portioned fare that you;re looking fo after a day of hiking or cycling. 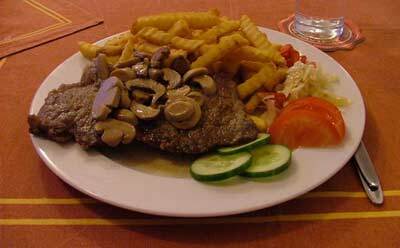 I chose the Steak and Mushrooms with chips for 132Kč, which was on the table within about 10 minutes and was good without being anything outstanding. The Pension Metuje restaurant has Pilsner on tap, but they also serve the local, (well, localish, from nearby Nachod) Primator beer. The 10 degree light and 12 degree dark are on tap as well as the rarer Primator wheat beer, and 24 degree double dark in bottles. Nice to see them supporting the local beers rather than converting to the big foreign-owned brewers, in the way that the pensions up around the park entrance have done. Incidentally the price of a half litre of the 10 degree was 15Kč and the dark was going for 18. 300ml glasses of the same beers were 12 and 14Kč respectively.